One year after Vumaquad’s release, Zipp unveiled the VumaChrono, an aerodynamism-optimized crankset, specifically designed for time trials and triathlon. Design : The crankset was designed without star. 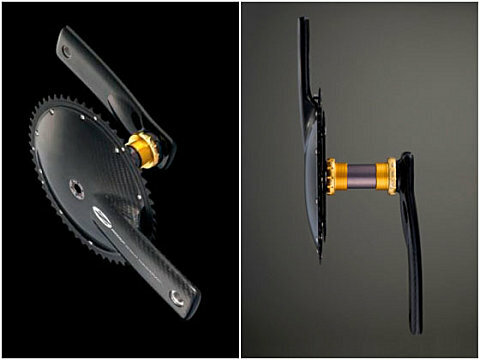 It is actually a carbon plate which is integrated to the crank. The diameter of this plate is slightly narrower than the chainring so the the teeth are a few millimeters above. also has 9 fixing bolts instead of 5. It weights about 860 grams with ceramics bearings as standard. Its Q factor is 146 mm. According to Zipp engineers, this revolutionary crankset would make you save 9 seconds during a 40 km event, which is the same as removing 12 spokes from the front wheel! Concerning the compatibilities, this crankset exists in BSA and italian thread. Thus there is no BB30 expected for the moment. Zipp may be waiting for this new diameter to become the standard. This crankset will be available with cranks from from 167,5 mm to 180 mm with 3 chainring combinations : 53/39, 54/42 and 55/42. 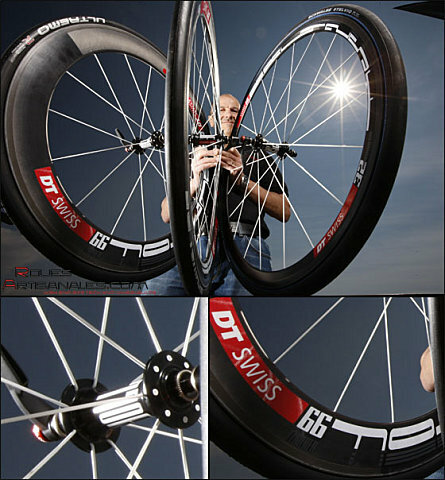 We featured them in a former article, about Taïwan show, the newest DT Swiss wheels will be available in limited quantities by the end of the month. They are coming with uni-directionnal carbon fibre, DT240s hubs with special decals, and white DT Aerolite spokes and three rims depth: 32mm, 46mm, 66mm. Each wheel will be available both for tubulars and clinchers for 2150 euros and 2480 euros, wheelbags, RWS quick releases, brake pads and special truing tool included. We find the weights a little too optimistics for the two first wheels, the 32mm and the 46mm. Indeed, if we refer to their names, supposed to be giving the weights of the wheels, the 32mm deep rim would weight 220g while the real weight is 240g (tubular). The 46mm deep rim has the same issue: it actually weights 300g, while it would be weighting only 260g according to the claimed weight! However this doesn’t affect the high quality we expect from the DT Swiss wheels. The product will be officially unveiled at the Eurobike 2009, early in September.